HENRY WEEKS. The most likely baptism for Henry, who brought up his family in Tilmanstone, is in 1682. Tilmanstone is 4 miles west of Deal. The surname is variously spelt Wilks or Weeks. This would make him 20 at the time of his marriage. His mother was Dorothy Stoakes of Tilmanstone. She was from a family of gentry who were titled ‘Mr’ and ‘Mrs’. Another possibility is in 1668 in nearby Sutton by Dover. This Henry would have been 35 at the time of his marriage, which is rather older than usual. The tendency in this family seems to be to marry young. MARY BELSEY was from Nonington, 3 miles east of Tilmanstone. It is now part of Eythorne. Marriage. St Mary the Virgin, Nonington. Henry was then of Waldershare, 2 miles from Tilmanstone. Mary was from Nonington. The couple set up home in Tilmanstone. 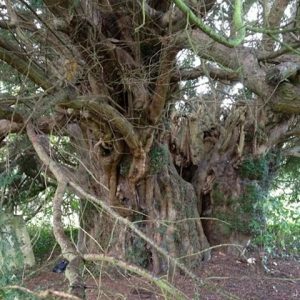 Tilmanstone is remarkable for the ancient yew in its churchyard, thought to be 1200 years old. Nine children were born, but only five survived childhood. 1704 Oct 8 Mary d of Henry and Mary Weeks. Mary was buried the same day. 1713 Nov 21 Sarah. Sarah was buried four days later. Their daughter Ann was buried on 19 Jun 1725 aged 8. The second Sarah was buried on 6 Aug 1728 aged 6. Elizabeth Wicks from Deal was buried in Tilmanstone on 23 Jan 1751/2. It is possible that this is their unmarried daughter, who would have been 45.